One of the most mysterious keys in Tarot, the Seven of Cups invites us to look at what we really value (and desire) in our lives. The man stands before seven cups, contemplating what is before him. A castle, jewels, a wreath of victory with a skull on the cup, the red dragon of temptation, the head of a beautiful woman, and the serpent of jealousy crowd before him. However, the center cup is veiled. It represents the man’s angel (or higher self) “shimmering with divine light,” according to Eden Gray. 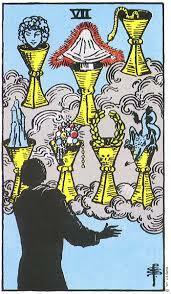 The Seven of Cups key asks us to be careful what we ask for – we WILL get it! And often what we THINK we want isn’t for our highest good! The key warns us to truly take stock of what we value, and who we trust. Always, our Higher Self knows the answers, if we would but seek them behind the veil of illusion.